In her three terms, the prime minister turned around the U.K. When Margaret Thatcher came to power the United Kingdom was in the last chance saloon. Labor markets were highly unionized; the commanding heights of the economy were dominated by loss-making behemoths; marginal tax rates were eye-wateringly high; and the rich, famous and talented were fleeing overseas. Either the U.K. fixed it then or headed ever deeper into economic and social turmoil. Some eleven years later she had put the great back into Great Britain. She cut marginal tax rates such that the "fame drain" and "brain drain" stopped and went into reverse. Film star, Michael Caine, for example returned from the U.S.; she would invite him to cocktail parties on the 2nd floor of 10 Downing Street, grab his arm, and take him around the room proudly introducing him to all her other guests with the words "This is Michael – he came back!" She returned scores of state enterprises to the private sector; these lumbering, subsidy guzzling embarrassments were transformed into nimble, profit-making, taxpaying, world-class companies so much so her privatization policy was copied around the world. Slowly but surely she brought the labor unions back under the rule of law; bullying by extremists stopped; days lost to strikes plummeted; and ordinary members took the leadership away from the communists. She similarly gave the staff in the newly privatized industries terrific deals on purchasing shares. Many of them did so and ownership of shares by individuals as opposed to say pension funds soared. She had an enormous impact on the U.K.’s Labour Party. She forced her opponents into realizing they were unelectable as long as they were committed to public ownership of the means of production. She was robust and principled on the international front. She faced down European Union bureaucrats in Brussels, Iranian Embassy hijackers, Argentinean military dictators and IRA bombers while working closely with the Pope and President Reagan to tear down that wall and defeat the evil empire without a shot being fired. And she relentlessly taught the nation a great deal of simple economic commonsense, so simple that her detractors called it the economics of a housewife. Whatever. It transformed how the nation viewed the economy and ensured that all future U.K. governments had to be more market friendly. Her three terms were a major turning point in history not just in the U.K. but worldwide. So what can we learn from Margaret or Lady T as we call her? She had a very strong moral compass; she knew the difference between good and evil and she made sure we all knew. She disciplined herself to do what was right and saw that as "the highroad to pride, self-esteem and personal satisfaction". She cut through the guff and nonsense and used short Anglo-Saxon words to get to the point. No "at this moment in time", but rather "now." She did lead and expected a great deal from all around her. The inside joke was that Rome would have been built in a day if she’d been the foreman on that job. The perception was that she was as tough as nails who handbagged opponents (as in hit people over the head with her brick-lined fashion item). In reality she listened to all sides and worried more than most people realize about some of her more radical policies. She championed policies that went with the grain of human nature such as selling public housing units at deep discounts and giving nationalized industry employees great share deals on privatization. She used four years of leading her party in opposition (1975-1979) by promoting people on merit rather than lineage, gender, or ethnicity, thus transforming "the stupid party" into really rather a smart one. A great deal of solid policy work was done in that time led by the Institute of Economic Affairs her favorite think tank. She knew and hugely admired Ronald Reagan with whom she only once fell out – Grenada was British and he failed to alert her to the U.S. invasion. And she did not try to do it all at once. The unions were brought under control by a series of acts over a decade, not one big bill. Likewise the state owned industries were privatized a few a year so the markets could absorb them. 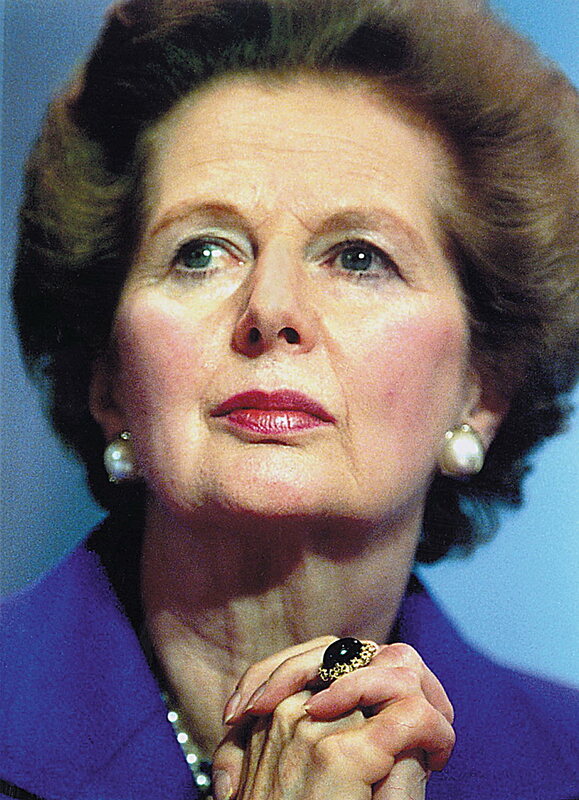 To sum up the secret of Lady T, in addition to having the right ideas you have to have a strong moral compass; you simplify your message; while leading you always listen; have policies that go with the grain of human nature; think through strategy ahead of time; build good teams; use circumstances; make great allies; prepare before you are in power; and have patience. While we mourn we must also celebrate a remarkable woman who rose from a very modest background to be one of the greatest leaders the world has ever seen. John Blundell is a visiting fellow at The Heritage Foundation and author of Margaret Thatcher: A Portrait of the Iron Lady.